The Serbian Orthodox Church (Serbian: Српска православна црква / Srpska pravoslavna crkva) is one of the autocephalous Eastern Orthodox Christian Churches. It is the second-oldest Slavic Orthodox Church in the world (after the Bulgarian Orthodox Church). The Serbian Orthodox Church comprises the majority of the population in Serbia, Montenegro, and the Republika Srpska entity of Bosnia and Herzegovina. It is organized into metropolises and eparchies located primarily in Serbia, Bosnia and Herzegovina, Montenegro, and Croatia, but also all over the world where Serb diaspora lives. The Serbian Orthodox Church is an autocephalous, or ecclesiastically independent, member of the Eastern Orthodox communion. Serbian Patriarch serves as first among equals in his church; the current patriarch is Irinej. The Church achieved autocephalous status in 1219 under the leadership of St. Sava, becoming independent Archbishopric of Žiča. Its status was elevated to that of a patriarchate in 1346, and was known afterwards as the Serbian Patriarchate of Peć. This patriarchate was abolished by the Ottoman Turks in 1766. The modern Serbian Orthodox Church was re-established in 1920 after the unification of the Patriarchate of Karlovci, the Metropolitanate of Belgrade and the Metropolitanate of Montenegro. Christianity spread to the Balkans beginning in the 1st century. Florus and Laurus are venerated as Christian martyrs of the 2nd century; they were murdered along with 300 Christians in Lipljan. Constantine the Great (306–337), born in Niš, was the first Christian Roman Emperor. Several bishops seated in what is today Serbia participated in the First Council of Nicaea (325), such as Ursacius of Singidunum. In 380, Eastern Roman Emperor Theodosius decreed that his subjects would be Christians according to the Council of Nicea formula. Greek was used in the Byzantine church, while the Roman church used Latin. With the definite split in 395, the line in Europe ran south along the Drina river. Among old Christian heritage is the Archbishopric of Justiniana Prima, established in 535, which had jurisdiction over the whole of present-day Serbia. However, the Archbishopric did not last, as the Slavs and Avars destroyed the region sometime after 602, when the last mention is made of it. In 731 Leo III attached Illyricum and Southern Italy (Sicily and Calabria) to Patriarch Anastasius of Constantinople, transferring the papal authority to the Eastern Church. The history of the early medieval Serbian Principality is recorded in the work De Administrando Imperio (DAI), compiled by the Byzantine Emperor Constantine VII Porphyrogenitus (r. 913–959). The DAI drew information on the Serbs from, among others, a Serbian source. The Serbs were said to have received the protection of Emperor Heraclius (r. 610–641), and Porphyrogenitus stressed that the Serbs had always been under Imperial rule. His account on the first Christianization of the Serbs can be dated to 632–638; this might have been Porphyrogenitus' construction, or may have really taken place, encompassing a limited group of chiefs and then very poorly received by the wider layers of the tribe. The establishment of Christianity as state religion dates to the time of Prince Mutimir (r. 851–891) and Byzantine Emperor Basil I (r. 867–886); Porphyrogenitus attests that Croats and Serbs sent delegates asking for baptism, thus Basil "baptized all of them that were unbaptized of the aforesaid nations". The Christianization was due partly to Byzantine and subsequent Bulgarian influence. At least during the rule of Kocel (861–874) in Pannonia, communications between Serbia and Great Moravia, where Methodius was active, must have been possible. This fact, the pope was presumably aware of, when planning Methodius' diocese as well as that of the Dalmatian coast, which was in Byzantine hands as far north as Split. There is a possibility that some Cyrillomethodian pupils reached Serbia in the 870s, perhaps even sent by Methodius himself. Serbia was accounted Christian as of about 870. The first Serbian bishopric was founded at Ras, near modern Novi Pazar on the Ibar river. According to Vlasto, the initial affiliation is uncertain; it may have been under the subordination of either Split or Durazzo, both then Byzantine. The early Ras church can be dated to the 9th–10th century, with the rotunda plan characteristic of first court chapels. The bishopric was established shortly after 871, during the rule of Mutimir, and was part of the general plan of establishing bishoprics in the Slav lands of the empire, confirmed by the Council of Constantinople in 879–880. The names of Serbian rulers through Mutimir (r. 851–891) are Slavic dithematic names, per the Old Slavic tradition. With Christianization in the 9th century, Christian names appear. The next generations of Serbian royalty had Christian names (Petar, Stefan, Pavle, Zaharije, etc. ), evident of strong Byzantine missions in the 870s. Petar Gojniković (r. 892–917) was evidently a Christian prince, and Christianity presumably was spreading in his time; also since Serbia bordered Bulgaria, Christian influences and perhaps missionaries came from there, increasing during the twenty-year peace. The Bulgarian annexation of Serbia in 924 was important for the future direction of the Serbian church, and by then, at latest, Serbia must have received the Cyrillic alphabet and Slavic religious text, already familiar but perhaps not yet preferred to Greek. In 1018–19, the Archbishopric of Ohrid was established after the Byzantines conquered Bulgaria. Greek replaced Bulgarian Slavic as the liturgical language. Serbia was ecclesiastically administered into several bishoprics: the bishopric of Ras, mentioned in the first charter of Basil II (r. 976–1025), became part of the Ohrid archbishopric and encompassed the areas of southern Serbia, by the rivers Raška, Ibar and Lim, evident in the second charter of Basil II. In the chrysobulls of Basil II dated to 1020, the Ras bishopric is mentioned as serving the whole of Serbia, with the seat at the Church of the Holy Apostles Peter and Paul, Ras. Among the first bishops were Leontius (fl. 1123-1126), Cyril (fl. 1141–1143), Euthemius (fl. 1170) and Kalinik (fl. 1196). It later joined the autocephalous Archbishopric of Žiča in 1219, at the time of Saint Sava. The 10th- or 11th-century Gospel Book Codex Marianus, written in Old Church Slavonic in the Glagolithic script, is one of the oldest known Slavic manuscripts and was partly written in the Serbian redaction of Old Church Slavonic. Other early manuscripts include 11th-century Grškovićev odlomak Apostola and Mihanovićev odlomak. Serbian prince Rastko Nemanjić, the son of Stefan Nemanja, took monastic vows at Mount Athos as Sava (Sabbas) in 1192. Three years later, his father joined him, taking monastic vows as Simeon. Father and son asked of the Holy Community that the Serbian religious centre be founded at the abandoned site of Hilandar, which they renovated, marking the beginning of a renaissance (in arts, literature and religion). 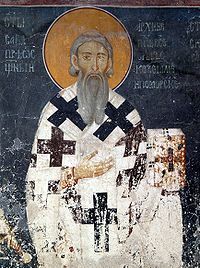 Sava's father died at Hilandar in 1199, and was canonised as St. Simeon. Sava stayed for some years, rising in rank, then returned to Serbia in 1207, taking with him the remains of his father, which he interred at the Studenica monastery, after reconciling his two quarreling brothers Stefan II with Vukan. Stefan II asked him to remain in Serbia with his clerics, which he did, providing widespread pastoral care and education to the people of Serbia. He founded several churches and monasteries, among them the Žiča monastery. Sava brought the regal crown from Rome, crowning his older brother "King of All Serbia" in the Žiča monastery in 1217. Sava returned to the Holy Mountain in 1217/18, marking the beginning of the real formation of the Serbian Church. He was consecrated in 1219 as the first Archbishop of the Serbian church, and was given autocephaly by Patriarch Manuel I of Constantinople, who was then in exile at Nicaea. In the same year Sava published Zakonopravilo (St. Sava's Nomocanon). Thus the Serbs acquired both forms of independence: political and religious. After this, in Serbia, he stayed in Studenica and continued to educate the Serbian people in their faith, and later he called for a council outlawing the Bogomils, who were regarded heretics. Sava appointed protobishops, sending them over all of Serbia to conduct baptisms, marriages etc.. To maintain his standing as the religious and social leader, he continued to travel among the monasteries and lands to educate the people. In 1221 a synod was held in the Žiča monastery, condemning Bogomilism. Eparchy of Hvosno (Hvostanska), seated at Monastery of the Holy Mother of God in Hvosno region (northern Metohija). Eparchy of Prizren (Prizrenska), seated at Prizren in the south of Metohija region. In 1229/1233, Saint Sava went on a pilgrimage to Palestine and in Jerusalem he met with Patriarch Athanasios II. Sava saw Bethlehem where Jesus was born, the Jordan River where Christ was baptised, and the Great Lavra of Saint Sabbas the Sanctified (Mar Saba monastery). Sava asked Athanasios II, his host, and the Great Lavra fraternity, led by hegoumenos Nicolas, if he could purchase two monasteries in the Holy Land. His request was accepted and he was offered the monasteries of Saint John the Theologian on Mount Sion and St. George's Monastery on Akona, both to be inhabited by Serbian monks. The icon Trojerucica (Three-handed Theotokos), a gift to the Great Lavra from St. John Damascene, was given to Sava and he, in turn, bequeathed it to Hilandar. Sava died in Trnovo, capital of the Second Bulgarian Empire, during the reign of Ivan Asen II of Bulgaria. According to his Biography, he fell ill following the Divine Liturgy on the Feast of the Epiphany, 12 January 1235. Sava was visiting Trnovo on his way back from the Holy Land, where he had founded a hospice for Syrian pilgrims in Jerusalem and arranged for Serbian monks to be welcomed in the established monasteries there. He died of pneumonia in the night between Saturday and Sunday, January 14, 1235, and was buried at the Cathedral of the Holy Forty Martyrs in Trnovo where his body remained until May 6, 1237, when his sacred bones were moved to the monastery Mileševa in southern Serbia. In 1253 the see was transferred to the Monastery of Peć by archbishop Arsenije. The Serbian primates had since moved between the two. Sometime between 1276-1292 the Cumans burned the Žiča monastery, and King Stefan Milutin renovated it in 1292-1309, during the office of Jevstatije II. In 1289-1290, the chief treasures of the ruined monastery, including the remains of Saint Jevstatije I, were transferred to Peć. The status of the Serbian Orthodox Church grew along with the expansion and heightened prestige of the Serbian kingdom. After King Stefan Dušan assumed the imperial title of tsar, the Serbian Archbishopric was correspondingly raised to the rank of Patriarchate in 1346. In the century that followed, the Serbian Church achieved its greatest power and prestige. In the 14th century Serbian Orthodox clergy had the title of Protos at Mount Athos. On April 16, 1346 (Easter), Stefan Dušan convoked a grand assembly at Skopje, attended by the Serbian Archbishop Joanikije II, Archbishop Nicholas I of Ohrid, Patriarch Simeon of Bulgaria and various religious leaders of Mount Athos. The assembly and clergy agreed on, and then ceremonially performed the raising of the autocephalous Serbian Archbishopric to the status of Patriarchate. The Archbishop was from now on titled Serbian Patriarch, although some documents called him Patriarch of Serbs and Greeks, with the seat at Patriarchal Monastery of Peć. The new Patriarch Joanikije II now solemnly crowned Stefan Dušan as "Emperor and autocrat of Serbs and Romans" (see Emperor of Serbs). The Patriarchal status resulted in raising bishoprics to metropolitanates, as for example the Metropolitanate of Skopje. The Patriarchate took over sovereignty on Mt. Athos and the Greek archbishoprics under the jurisdiction of the Patriarchate of Constantinople (the Archbishopric of Ohrid remained autocephalous), which resulted in Dušan's excommunication by Patriarch Callistus I of Constantinople in 1350. Serbian Patriarchate of Peć (16th-17th century). The Ottoman Empire finally conquered the Serbian Despotate in 1459, the Bosnian Kingdom in 1463, Herzegovina in 1482 and Montenegro in 1499. All of the conquered lands were divided into sanjaks. Although some Serbs converted to Islam, most continued their adherence to the Serbian Orthodox Church. The Church itself continued to exist throughout the Ottoman period, though not without some disruption. After the death of Serbian Patriarch Arsenije II in 1463, a successor was not elected. The Patriarchate was thus de facto abolished, and the Serbian Church passed under the jurisdiction of Archbishopric of Ohrid and ultimately the Ecumenical Patriarchate which exercised jurisdiction over all Orthodox of the Ottoman Empire under the millet system. After several failed attempts, made from c. 1530 up to 1541 by metropolitan Pavle of Smederevo to regain the autocephaly by seizing the throne of Peć and proclaiming himself not only Archbishop of Peć, but also Serbian Patriarch, the Serbian Patriarchate was finally restored in 1557 under the Sultan Suleiman II, thanks to the mediation of pasha Mehmed Sokolović who was Serbian by birth. His cousin, one of the Serbian Orthodox bishops Makarije Sokolović was elected Patriarch in Peć. The restoration of the Patriarchate was of great importance for the Serbs because it helped the spiritual unification of all Serbs in the Ottoman Empire. The Patriarchate of Peć also included some dioceses in western Bulgaria. In the time of Serbian Patriarch Jovan Kantul (1592-1614), the Ottoman Turks took the remains of Saint Sava from monastery Mileševa to the Vračar hill in Belgrade where they were burned by Sinan Pasha on a stake to intimidate the Serb people in case of revolts (see Banat Uprising) (1594). The Temple of Saint Sava was built on the place where his remains were burned. After consequent Serbian uprisings against the Turkish occupiers in which the Church had a leading role, the Ottomans abolished the Patriarchate once again in 1766. The Church returned once more under the jurisdiction of the Ecumenical Patriarch of Constantinople. This period of rule by the so-called "Phanariots" was a period of great spiritual decline because the Greek bishops had very little understanding of their Serbian flock. During this period, many Christians across the Balkans converted to Islam to avoid severe taxes imposed by the Turks in retaliation for uprisings and continued resistance. Many Serbs migrated with their hierarchs to the Habsburg Monarchy where they had been granted autonomy. In 1708, an autonomous Serbian Orthodox Metropolitanate of Karlovci was created, that would later become a patriarchate (1848-1920). The church's close association with Serbian resistance to Ottoman rule led to Eastern Orthodoxy becoming inextricably linked with Serbian national identity and the new Serbian monarchy that emerged from 1815 onwards. The Serbian Orthodox Church in the Principality of Serbia gained its autonomy in 1831, and was organized as the Metropolitanate of Belgrade, remaining under the supreme ecclesiastical jurisdiction of the Ecumenical Patriarchate of Constantinople. Principality of Serbia gained full political independence from the Ottoman Empire in 1878, and soon after that negotiations were initiated with the Ecumenical Patriarchate, resulting in canonical recognition of full ecclesiastical independence (autocephaly) for the Metropolitanate of Belgrade in 1879. At the same time, the Serbian Orthodox eparchies in Bosnia and Herzegovina remained under supreme ecclesiastical jurisdiction of the Ecumenical Patriarchate, but gained internal autonomy. In the southern eparchies, that remained under the Ottoman rule, Serbian metropolitans were appointed by the end of the 19th century. Thus by the beginning of the 20th century several distinctive Serbian ecclesiastical provinces existed, including the Patriarchate of Karlovci in the Habsburg Monarchy, the Metropolitanate of Belgrade in the Kingdom of Serbia, and the Metropolitanate of Montenegro in the Principality of Montenegro. After World War I all the Orthodox Serbs were united under one ecclesiastical authority, and two Serbian churches were united into the single Serbian Orthodox Church in 1920 with the election of Serbian Patriarch Dimitrije. It gained great political and social influence in the inter-war Kingdom of Yugoslavia, during which time it successfully campaigned against the Yugoslav government's intentions of signing a concordat with the Holy See. The united Serbian Orthodox Church kept under its jurisdiction the Eparchy of Buda in Hungary. In 1921, the Serbian Orthodox Church created a new eparchy for the Czech lands, headed by bishop Gorazd Pavlik. At the same time, the Serbian Church among the diaspora was reorganized, and the eparchy (diocese) for the United States and Canada was created. In 1931 another diocese was created, called the Eparchy of Mukačevo and Prešov, for the Eastern Orthodox Christians in Slovakia and Carpathian Rusynia. During the Second World War the Serbian Orthodox Church suffered severely from persecutions by the occupying powers and the rabidly anti-Serbian Ustaše regime of Independent State of Croatia, which sought to create a "Croatian Orthodox Church" which Orthodox Serbs were forced to join. Many Serbs were killed, expelled or forced to convert to Catholicism during the Serbian Genocide; bishops and priests of the Serbian Orthodox Church were singled out for persecution, and many Orthodox churches were damaged or destroyed. After the war the Church was suppressed by the communist government of Josip Broz Tito, which viewed it with suspicion due to the Church's links with the exiled Serbian monarchy and the nationalist Chetnik movement. Along with other ecclesiastical institutions of all denominations, the Church was subject to strict controls by the Yugoslav state, which prohibited the teaching of religion in schools, confiscated Church property and discouraged religious activity among the population. In 1963, the Serbian Church among the diaspora was reorganized, and the eparchy for the United States and Canada was divided into three separate eparchies. At the same time, some internal divisions sparked in the Serbian diaspora, leading to the creation of the separate "Free Serbian Orthodox Church". Division was healed in 1991, and Metropolitanate of New Gračanica was created, within the united Serbian Orthodox Church. The gradual demise of Yugoslav communism and the rise of rival nationalist movements during the 1980s also led to a marked religious revival throughout Yugoslavia, not least in Serbia. The Serbian Patriarch Pavle supported the opposition to Slobodan Milošević in the 1990s. The Macedonian Orthodox Church was created in 1967, effectively as an offshoot of the Serbian Orthodox Church in what was then the Socialist Republic of Macedonia, as part of the Yugoslav drive to build up a Macedonian national identity. This was strongly resisted by the Serbian Church, which does not recognize the independence of its Macedonian counterpart. Campaigns for an independent Montenegrin Orthodox Church have also gained ground in recent years. The Yugoslav wars gravely impacted several branches of the Serbian Orthodox Church. Many Serbian Orthodox Church clergy supported the war, while others were against it. Many churches in Croatia were damaged or destroyed during the Croatian War (1991–95). The bishops and priests and most faithful of the eparchies of Zagreb, of Karlovac, of Slavonia and of Dalmatia became refugees. The latter three were almost completely abandoned after the exodus of the Serbs from Croatia in 1995 (Operation Storm). The eparchy of Dalmatia also had its see temporarily moved to Knin after the Republic of Serbian Krajina was established. The eparchy of Slavonia had its see moved from Pakrac to Daruvar. After Operation Storm, two monasteries were particularly damaged, the Krupa monastery built in 1317, and the Krka monastery built in 1345. The eparchies of Bihać and Petrovac, Dabar-Bosnia and Zvornik and Tuzla were also dislocated due to the war in Bosnia and Herzegovina. The eparchy see of Dabar-Bosnia was temporarily moved to Sokolac, and the see of Zvornik-Tuzla to Bijeljina. Over a hundred Church-owned objects in the Zvornik-Tuzla eparchy were destroyed or damaged during the war. Many monasteries and churches in the Zahumlje eparchy were also destroyed. Numerous faithful from these eparchies also became refugees. Right: Devič monastery after it was burned down in 2004 unrest in Kosovo. By 1998 the situation had stabilized in both countries. Most of the property of the Serbian Orthodox Church was returned to normal use, the bishops and priests returned, and that which was destroyed, damaged or vandalized was restored. The process of rebuilding several churches is still under way, notably the cathedral of the Eparchy of Upper Karlovac in Karlovac. The return of the Serbian Orthodox Church faithful also started, but they are not nearly close to their pre-war numbers, as of 2004. Due to the Kosovo War, after 1999 numerous Serbian Orthodox holy sites in the province were left occupied only by clergy. Since the arrival of NATO troops in June 1999, 156 Serbian Orthodox churches and monasteries have been damaged or destroyed and several priests have been killed. During the few days of the 2004 unrest in Kosovo, 35 Serbian Orthodox churches and monasteries were damaged and some destroyed by Albanian mobs. Thousands of Serbs were forced to move from Kosovo due to the numerous attacks of Kosovo Albanians on Serbian churches and Serbs. The process of church reorganization among the diaspora and full reintegration of the Metropolitanate of New Gračanica was completed from 2009 to 2011. By that, full structural unity of Serbian church institutions in the diaspora was achieved. Based on the official census results in countries which encompass territorial canonic jurisdiction of the Serbian Orthodox Church (Serb autochthonous region of Western Balkans), there are more than 8 million adherents of the church. Orthodoxy is the largest single religious faith in Serbia with 6,079,296 adherents (84.5% of the population belonging to it) according to the 2011 census, and in Montenegro with 460,383 (74%). It is the second largest faith in Bosnia and Herzegovina with 31.2% of adherents, and in Croatia with 4.4% of adherents. Figures for eparchies abroad (Western Europe, North America, and Australia) is unknown although some estimates can be reached based on the size of Serb diaspora, which numbers over 2 million people. The head of the Serbian Orthodox Church, the patriarch, also serves as the head (metropolitan) of the Metropolitanate of Belgrade and Karlovci. Irinej became patriarch on 22 January 2010. Serbian Orthodox patriarchs use the style His Holiness the Archbishop of Peć, Metropolitan of Belgrade and Karlovci, Serbian Patriarch. The highest body of the Church is the Holy assembly of Bishops (Serbian: Sveti arhijerejski sabor, Свети архијерејски сабор). It consists of the Patriarch, the Metropolitans, Bishops, Archbishop of Ohrid and Vicar Bishops. It meets twice a year - in spring and in autumn. The Holy assembly of Bishops makes important decisions for the church and elects the patriarch. The executive body of the Serbian Orthodox Church is the Holy Synod. It has five members: four bishops and the patriarch. The Holy Synod takes care of the everyday operation of the Church, holding meetings on regular basis. 1 autonomous archbishopric, headed by archbishop, the Autonomous Archbishopric of Ohrid. It is further divided into 1 eparchy headed by the metropolitan and 6 eparchies headed by bishops. Dioceses are further divided into episcopal deaneries, each consisting of several church congregations or parishes. Church congregations consist of one or more parishes. A parish is the smallest Church unit - a communion of Orthodox faithful congregating at the Holy Eucharist with the parish priest at their head. The Autonomous Archbishopric of Ohrid or Orthodox Ohrid Archbishopric is an autonomous archbishopric in the Republic of Macedonia under the jurisdiction of the Serbian Orthodox Church. It was formed in 2002 in opposition to the Macedonian Orthodox Church, which had had a similar relationship with the Serbian Orthodox Church prior to 1967, when it unilaterally declared itself autocephalous. This archbishopric is divided into one metropolitanate, Skopje, and the six eparchies of Bregalnica, Debar and Kičevo, Polog and Kumanovo, Prespa and Pelagonija, Strumica and Veles and Povardarje. Services cannot properly be conducted by a single person, but must have at least one other person present. Usually, all of the services are conducted on a daily basis only in monasteries and cathedrals, while parish churches might only do the services on the weekend and major feast days. The Divine Liturgy is the celebration of the Eucharist. The Divine Liturgy is not celebrated on weekdays during the preparatory season of Great Lent. Communion is consecrated on Sundays and distributed during the week at the Liturgy of the Presanctified Gifts. Services, especially the Divine Liturgy, can only be performed once a day on any particular altar. The Serbian Orthodox Church is characterized by monotheistic Trinitarianism, a belief in the Incarnation of the Logos (Son of God), a balancing of cataphatic theology with apophatic theology, a hermeneutic defined by Sacred Tradition, a concrete ecclesiology, a robust theology of the person, and a therapeutic soteriology. A key part of the Serbian Orthodox religion is the Slava, a celebration of the Clan Patron Saint, placed into Serb Orthodox religious canon by the first Serb archbishop Saint Sava. The Serbian Orthodox Church is in full communion with the Ecumenical Patriarchate of Constantinople (which holds a special place of honour within Orthodoxy and serves as the seat for the Ecumenical Patriarch, who enjoys the status of first-among-equals) and all of the autocephalous Eastern Orthodox church bodies. It has been a member of the World Council of Churches since 1965, and of the Conference of European Churches. However, the church is currently in conflict with the non-canonical Macedonian Orthodox Church and the Montenegrin Orthodox Church. An example of the Serbo-Byzantine style in the Gračanica monastery (World Heritage Site). "A Portrait of the Evangelist", a miniature from the Radoslav Gospel (1429). Serbian medieval churches were built in the Byzantine spirit. The Raška style refers to the Serbian architecture from the 12th to the end of the 14th century (Studenica, Hilandar, Žiča). The Vardal style, which is the typical one, was developed in the late 13th century combining Byzantine and Serbian influences to form a new architectural style (Gračanica, Patriarchal Monastery of Peć). By the time of the Serbian Empire, the Serbian state had enlarged itself over Macedonia, Epirus and Thessaly all the way to the Aegean Sea, which resulted in stronger influences from Byzantine art tradition. The Morava style refers to the period of the fall of Serbia under the Ottoman Empire, from 1371 to 1459 (Ravanica, Ljubostinja, Kalenić, Resava). During the 17th century many of the Serbian Orthodox churches that were built in Belgrade took all the characteristics of baroque churches built in the Habsburg-occupied regions where Serbs lived. The churches usually had a bell tower, and a single nave building with the iconostasis inside the church covered with Renaissance-style paintings. These churches can be found in Belgrade and Vojvodina, which were occupied by the Austrian Empire from 1717 to 1739, and on the border with Austrian (later Austria-Hungary) across the Sava and Danube rivers from 1804 when Serbian statehood was re-established. Icons are replete with symbolism meant to convey far more meaning than simply the identity of the person depicted, and it is for this reason that Orthodox iconography has become an exacting science of copying older icons rather than an opportunity for artistic expression. The personal, idiosyncratic and creative traditions of Western European religious art are largely lacking in Orthodox iconography before the 17th century, when Russian and Serbian icon painting was influenced by religious paintings and engravings from Europe. Large icons can be found adorning the walls of churches and often cover the inside structure completely. Orthodox homes often likewise have icons hanging on the wall, usually together on an eastern facing wall, and in a central location where the family can pray together. The Serbian tricolour with a Serbian cross is used as the official[year needed] flag of the Serbian Orthodox Church. ^ Johnston & Sampson 1995, p. 330. ^ Fine 1991, p. 116. ^ Treadgold 1997, p. 354–355. ^ Живковић 2006, p. 23. ^ Живковић 2006, p. 15. ^ Живковић 2002, pp. 207–209. ^ a b c d e f g h i j k l Vlasto 1970, p. 208. ^ SANU (1995). Glas. 377–381. SANU. p. 37. ^ Fine 1991, p. 141. ^ Fine 1991, pp. 141–142. ^ Vlasto 1970, p. 209. ^ Vlasto 1970, p. 218. ^ a b c d e f g Radić 2010. ^ Ferrari, Durham & Sewell 2003, p. 295. ^ Vlasto 1970, pp. 222, 233. ^ a b Vásáry 2005, p. 100-101. ^ Pavlowitch 2002, p. 11. ^ Ljubinković 1975, p. VIII. ^ Fine 1994, pp. 309–310. ^ Daskalov & Marinov 2013, p. 29. ^ Ćirković 2004, p. 192-193. ^ Kiminas 2009, p. 20-21. ^ Ćirković 2004, p. 231. ^ Ćirković 2004, p. 244. ^ Branka Pantic; Arsic Aleksandar; Miroslav Ivkovic; Milojkovic Jelena. "Republicki zavod za statistiku Srbije". Retrieved 5 March 2015. ^ Николић 2011, p. 50. ^ Пржић 1939, p. 21. Buchenau, Klaus (2014). "The Serbian Orthodox Church". In Leustean, Lucian N. (ed.). Eastern Christianity and Politics in the Twenty-First Century. London-New York: Routledge. pp. 67–93. Ćurčić, Slobodan (1979). Gračanica: King Milutin's Church and Its Place in Late Byzantine Architecture. Pennsylvania State University Press. Daskalov, Rumen; Marinov, Tchavdar, eds. (2013). Entangled Histories of the Balkans: Volume One: National Ideologies and Language Policies. BRILL. Дучић, Нићифор (1894). Историја Српске православне цркве од првијех десетина VII в. до наших дана. Београд: Државна штампарија Краљевине Србије. Дурковић-Јакшић, Љубомир (1951). Из историје Српске православне цркве. Београд: Научна књига. Ferrari, Silvio; Durham, Cole; Sewell, Elizabeth A., eds. (2003). Law and Religion in Post-Communist Europe. Leuven: Peeters Publishers. Fortescue, Adrian (1908). The Orthodox Eastern Church. London: Catholic Truth Society. Fotić, Aleksandar (2008). "Serbian Orthodox Church". Encyclopedia of the Ottoman Empire. New York: Infobase Publishing. pp. 519–520. Jagić, Vatroslav (1883). Quattuor Evangeliorum versionis palaeoslovenicae Codex Marianus Glagoliticus, characteribus Cyrillicis transcriptum (PDF). Berlin: Weidmann. Johnston, Douglas; Sampson, Cynthia, eds. (1995). Religion, the Missing Dimension of Statecraft. New York & Oxford: Oxford University Press. Kašić, Dušan, ed. (1965). Serbian Orthodox Church: Its past and present. 1. Belgrade: Serbian Orthodox Church. Kašić, Dušan, ed. (1966). Serbian Orthodox Church: Its past and present. 2. Belgrade: Serbian Orthodox Church. Kašić, Dušan, ed. (1972). Serbian Orthodox Church: Its past and present. 3. Belgrade: Serbian Orthodox Church. Kašić, Dušan, ed. (1973). Serbian Orthodox Church: Its past and present. 4. Belgrade: Serbian Orthodox Church. Kašić, Dušan, ed. (1975). Serbian Orthodox Church: Its past and present. 5. Belgrade: Serbian Orthodox Church. Kašić, Dušan, ed. (1983). Serbian Orthodox Church: Its past and present. 6. Belgrade: Serbian Orthodox Church. Kia, Mehrdad (2011). Daily Life in the Ottoman Empire. Santa Barbara, California: Greenwood Press. Kidd, Beresford James (1927). The Churches of Eastern Christendom: From A.D. 451 to the Present Time. London: Faith Press. Komatina, Predrag (2015). "The Church in Serbia at the Time of Cyrilo-Methodian Mission in Moravia". Cyril and Methodius: Byzantium and the World of the Slavs. Thessaloniki: Dimos. pp. 711–718. Magocsi, Paul Robert (2002). Historical Atlas of Central Europe. Seattle: University of Washington Press. Марјановић, Чедомир (1929). Историја Српске цркве. 1. Београд: Штампарија Св. Сава. Марјановић, Чедомир (1930). Историја Српске цркве. 2. Београд: Штампарија Св. Сава. Mileusnić, Slobodan, ed. (1989). Serbian Orthodox Church: Its past and present. 7. Belgrade: Serbian Orthodox Church. Милеуснић, Слободан (1989). Свети Срби. Крагујевац: Каленић. Николић, Марко (2011). Екуменски односи Српске православне и Римокатоличке цркве 1962-2000. године (Ecumenical Relations of Serbian Orthodox and Roman Catholic Church from 1962-2000). Београд: Службени гласник. Pavlović, Jovan, ed. (1992). Serbian Orthodox Church: Its past and present. 8. Belgrade: Serbian Orthodox Church. Pavlovich, Paul (1989). The History of the Serbian Orthodox Church. Serbian Heritage Books. ISBN 978-0-9691331-2-4. Popović, Svetlana (2002) . "The Serbian Episcopal sees in the thirteenth century (Српска епископска седишта у XIII веку)". Старинар (51): 171–184. Пржић, Илија А. (1939). Законодавство Српске православне цркве. Београд: Геца Кон. Пузовић, Предраг (2000). Кратка историја Српске православне цркве. Крагујевац: Каленић. Radić, Radmila (1995). Verom protiv vere: Država i verske zajednice u Srbiji 1945-1953. Beograd: Institut za noviju istoriju Srbije. Радић, Радмила (1998). Хиландар у државној политици Краљевине Србије и Југославије 1896-1970. Београд: Службени лист СРЈ. Радић, Радмила (2002a). Држава и верске заједнице 1945-1970. књ. 1. Београд: Институт за новију историју Србије. Радић, Радмила (2002b). Држава и верске заједнице 1945-1970. књ. 2. Београд: Институт за новију историју Србије. Радић, Радмила (2005). Патријарх Павле: Биографија. Београд: Новости, Танјуг. Радић, Радмила (2006). Живот у временима: Гаврило Дожић 1881-1950. Београд: Институт за новију историју Србије. Radić, Radmila (2007). "Serbian Christianity". The Blackwell Companion to Eastern Christianity. Malden: Blackwell Publishing. pp. 231–248. Radojević, Mira; Mićić, Srđan B. (2015). "Serbian Orthodox Church cooperation and frictions with Ecumenical Patriarchate of Constantinople and Bulgarian Exarchate during interwar period". Studia academica šumenesia. 2: 126‒143. Roudometof, Victor (2001). Nationalism, Globalization, and Orthodoxy: The Social Origins of Ethnic Conflict in the Balkans. London: Greenwood Press. Самарџић, Радован (1986). "Српска црква у Турском Царству 1690-1766". Историја српског народа. 4 (1). Београд: Српска књижевна задруга. pp. 531–552. Самарџић, Радован (1993). "Српски народ под турском влашћу". Историја српског народа. 3 (1). Београд: Српска књижевна задруга. pp. 5–114. Самарџић, Радован (1993). "Срби у ратовима Турске до 1683". Историја српског народа. 3 (1). Београд: Српска књижевна задруга. pp. 115–424. Самарџић, Радован (1993). "Српска православна црква у XVI и XVII веку". Историја српског народа. 3 (2). Београд: Српска књижевна задруга. pp. 5–102. Слијепчевић, Ђоко М. (1962). Историја Српске православне цркве (History of the Serbian Orthodox Church). 1. Минхен: Искра. Слијепчевић, Ђоко М. (1966). Историја Српске православне цркве (History of the Serbian Orthodox Church). 2. Минхен: Искра. Слијепчевић, Ђоко М. (1986). Историја Српске православне цркве (History of the Serbian Orthodox Church). 3. Келн: Искра. Sotirović, Vladislav B. (2011). "The Serbian Patriarchate of Peć in the Ottoman Empire: The First Phase (1557–94)". Serbian Studies: Journal of the North American Society for Serbian Studies. 25 (2): 143–169. Stanojević, Stanoje, ed. (1928). "Pećska Patrijaršija". Narodna enciklopedija srpsko-hrvatsko-slovenačka (PDF). 3. pp. 389–399. Stephenson, Paul (2000). Byzantium's Balkan Frontier: A Political Study of the Northern Balkans, 900–1204. Cambridge: Cambridge University Press. Стојанчевић, Владимир (2006). Из историје Српске православне цркве. Ниш: Епархија нишка. Treadgold, Warren T. (1997). A History of the Byzantine State and Society. Stanford, CA: Stanford University Press. Веселиновић, Рајко (1993). "Срби у Великом рату 1683-1699". Историја српског народа. 3. Београд: Српска књижевна задруга. pp. 491–574. Вуковић, Сава (1996). Српски јерарси од деветог до двадесетог века (Serbian Hierarchs from the 9th to the 20th Century). Евро, Унирекс, Каленић. Vuković, Sava (1998). History of the Serbian Orthodox Church in America and Canada 1891–1941. Kragujevac: Kalenić. Živković, Tibor (2013). "On the Baptism of the Serbs and Croats in the Time of Basil I (867–886)" (PDF). Studia Slavica et Balcanica Petropolitana (1): 33–53. Wikimedia Commons has media related to Serbian Orthodox Church.